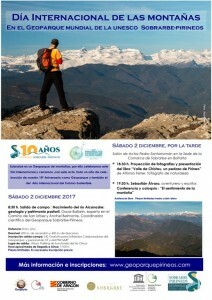 On December 11, the UN commemorates the International Day of Mountains and the Geopark Sobrarbe-Pirineos wants to join this initiative because, first of all, Sobrarbe is a mountain Geopark. With this activity we closed a whole year of celebration of our 10th anniversary as Geopark and also of the International Year of Sustainable Tourism. A field trip to the source of the Alcanadre River from where you can enjoy an extraordinary panoramic view of part of the Pyrenees and our main mountains, guided by Oscar Ballarín and Ánchel Belmonte. An exit that we retake after having to suspend it due to bad weather on two occasions. We hope and trust that this time we can enjoy it (previous registration is necessary). In the afternoon two interesting talks that will show us the beauty of the mountains and transmit the passion and feeling that our speakers have for them: Alfonso Ferrer and Sebastián Álvaro (free attendance without prior registration).